We observe that state-sponsored espionage groups steal intellectual property for economic advantage. While the main players appear to understand this threat, many smaller supply-chain vendors and contractors may not. The targeting of third-party vendors and contractors is a tactic these threat actors are increasingly using to spy on hardened targets. A recent discovery of a treasure trove of openly available sensitive data is a reminder and call-to-action for many smaller enterprises to improve their cyber resilience. Attend this session to hear more about this case and threat actors potentially using these tactics. Join if you’re from a large organization that needs to understand third-party risk or if you’re from a small organization that needs to demonstrate due diligence to your largest customers. Threat intelligence has the power to enhance an organization’s security effectiveness, improve its time-to-response, and reduce business risk. No matter where an organization is on the continuum of security operations maturity, threat intelligence can provide significant value. The question is, what is the best way to maximize that value? What advantages can you gain through simple process or technology changes to ensure that you’re ready to respond quickly to the threats that matter? Today’s sophisticated attackers often hide within the noise of abundant alerts generated by a myriad of security products. Limited budgets, a shortage of skilled security staff, and rigid regulatory requirements make it difficult for organizations to effectively identify and understand these threats—negatively affecting risk-based decision making and asset protection. Effective cyber security requires an understanding of who is likely to target you, and how they operate. FireEye analysts work to identify cyber espionage trends and gather the evidence needed to name APT groups. The most recently named groups—APT38, APT39, APT40—exemplify the variety of state-sponsored threats that network defenders face today: a North Korean operator specializing in bank heists, an Iranian group tracking personal data and specific individuals and a long-established Chinese actor shifting its targeting to reflect changing geopolitics. Explore the latest developments behind today’s attacker techniques, behaviors, and motivations sourced from this year’s M-Trends 2019 Report, our annual publication based on FireEye Mandiant’s frontline investigations of the most interesting and impactful cyber attacks in 2018. Register for the webinar NOW! FireEye Chat is a new quarterly talk show that brings guest experts front and center to cover today’s most important cybersecurity topics. • The most significant trends in today’s cyber threat landscape. Watch now to get unique insights, direct from the frontlines, in what promises to be a series of lively and thought-provoking exchanges. Through 2022, at least 95% of cloud security failures are predicted to be the customer’s fault (Gartner). But change how you think about cloud security, and you can be a success story. You’ll also learn how to identify a trusted advisor for cloud migration so you can confidently take advantage of cloud advancements. Many breached organizations—of all sizes—believed they had effective security programs and incident response plans. Reality proved otherwise. Now, executive leaders are far more concerned with incident preparedness. When the Board asks, ‘How ready are we, really?’ your security team must have a defensible response. Join this webinar today to learn what it takes for your team to know how they would perform under a real threat, before they actually have to. Attackers will continue to be effective through an increase in sophistication, but they will also be successful due to the challenges organisations face in recruiting and retaining skilled cyber professionals. During this webinar we will be covering how the industry has been affected by a cyber-skills shortage and the challenges of inhouse vs. outsourcing of cyber security operations. And how this gap can be covered with ‘on-demand’ expert resources who have with them, real time insight and expertise of dealing with cyber breaches. As the door closes on 2018, we walk away armed with knowledge about what’s to come in 2019 and beyond. We know attackers will attack and defenders will be tasked with stopping them, but there is a lot more we can do to be prepared for upcoming threats and ensure we’re innovating faster than bad actors. Register today to learn what lies ahead and stay one step ahead of cyber security threats. APT38 is a newly identified cyber-crime organization that has attempted to steal over $1.1 billion by attacking more than 16 financial organizations in 13 different countries – many of them located in the Asia Pacific region. This North Korean regime-backed group is careful in its planning and often lives in a compromised victim environment for months before initiating their fraudulent banking transactions. 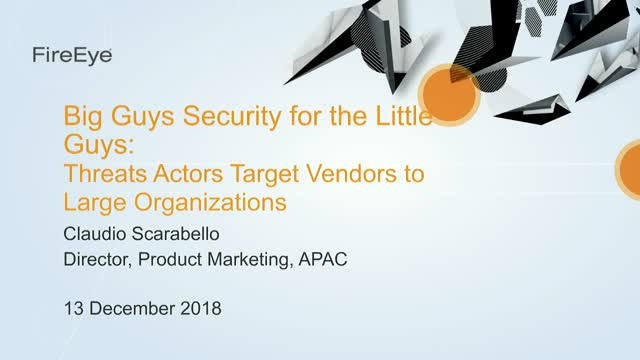 Please join the FireEye experts for a detailed discussion on the tactics, techniques and procedures used by APT38 and what you can do to defend your organization. Any one of these threats would increase activity in an industry, but the presence of all three likely accounts for the large number of intrusions in financial services organizations. Mandiant responded to an incident in 2017 at a critical infrastructure organisation where an attacker deployed malware designed to manipulate industrial safety systems. The targeted systems provided emergency shutdown capability for industrial processes. This malware, called TRITON, is an attack framework built to interact with Triconex Safety Instrumented System (SIS) controllers. Join David Grout, our Technical Director for South EMEA, for a live session and get insights into the technical framework details and the potential outcomes. In many ways, public cloud is more secure than a traditional data center. And yet, assets on the public cloud are still being compromised just as those stored in traditional data centers. Mandiant, the industry leader in incident response consulting, estimates that 15 percent of all of its incident response involves public cloud assets. So, if the cloud is more secure, why is it still getting hacked? Due to the combination of growing cyber risks threatening critical assets of organizations today, and firmer security regulations enforced by lawmakers across the globe, security leaders are increasingly taking steps improve their risk management processes and key stakeholder communication—to enable better decision-making around security domains and necessary investments. This includes adoption of new risk management methods to generate realistic risk forecasts, effective metrics techniques, and a clear roadmap for capability improvements.